When feeling overwhelmed by the mountain of tasks ahead of you, sit down, take a breath, and write a to-do list. This isn’t just a sneaky form of procrastination: Studies have shown that we’re more likely to achieve our goals when we commit them to paper. If you really want to make the most of your planning time, ditch the old-school bullet format. These expert-backed strategies will help you confront your deadlines with confidence. On a traditional to-do list, obligations that take hours to complete appear alongside tasks that last a few minutes. Without time-blocking, it can be hard to tell them apart. Fast Company defines time-blocking as assigning individual tasks to manageable time slots. So instead of writing out everything on your plate for the day and hoping you have enough time to tackle it all, this approach lets you set realistic goals for yourself one task at a time. To-do lists are inherently optimistic. By writing something down, you’re betting that you’ll have the time and energy to make it happen. But sometimes life gets in the way of your fine-tuned plans. 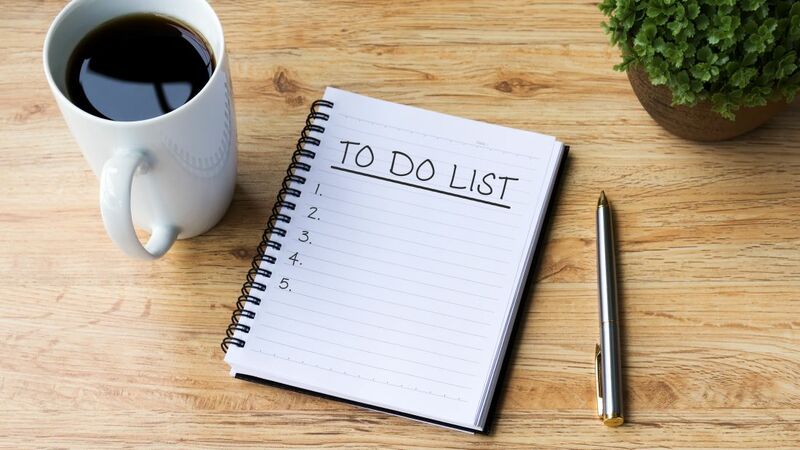 One strategy for setting reasonable goals without selling yourself short is to make two lists: one for high-energy days and another for days when you struggle to roll out of bed. According to blogger and Bullet Journal enthusiast Kara Benz, both lists should follow an “if/then” model. An entry on the first list, for example, might read, “If I have a lot of energy, then I will take a walk at lunch.” The second list should feature more mindless tasks like cleaning out your inbox, organizing your desk, or even setting aside time for a power nap. President Dwight Eisenhower once said, "I have two kinds of problems, the urgent and the important. The urgent are not important, and the important are never urgent." Someone found a way to turn this maddening statement into a rather useful prioritization system. Plugging your to-do list into an Eisenhower Matrix breaks it into four categories. The first box, filled with items that are both urgent and important, is to be tackled immediately. The second set, labeled important but not urgent, can be scheduled for a later time. Tasks deemed urgent but not important can be delegated to others if possible, and entries that are neither urgent nor important should be crossed off the list altogether. Many people use their own special shorthand when writing to-do lists—which is fine as long as they can decipher it hours later. If you’ve ever had trouble decoding the notes you write to yourself, consider doodling quick images to get your message across. One study found that words are more likely to stick in our memories if we draw pictures of them instead of writing them down. This is likely because drawing takes up more mental facilities (visualization, analysis, motor skills) than language alone. So not only does creating a visual to-do list help you memorize tasks, it also forces you to think them through ahead of time. Instead of organizing entries by time or urgency, a one-three-five list looks at the size of the tasks at hand. Start by identifying the biggest job of the day—that goes in the number one slot. From there, pick three smaller, but still important tasks to fill out the middle of your list. Finish it off with five small items you’ll be able to take care of quickly. COO and co-founder of The Muse Alex Cavoulacos is a notable fan of this method. She wrote for her website, “Planning ahead like this also means you'll be able to have more informed conversations with your manager when he or she drops something new on you that needs to be done right away—as well as the tools to re-prioritize your other work.” So while it may be impossible to stick with what’s on the list every day, it doesn’t hurt to have it as a guideline. Like a calendar, a Kanban board helps you keep your day organized by visualizing the tasks ahead. Kanban was popularized as a scheduling strategy for manufacturing plants, but as productivity experts Jim Benson and Tonianne DeMaria Barry write in their book Personal Kanban: Mapping Work | Navigating Life, it works on an individual level as well. Start by finding a board. It can be a tool on your computer, a white board covered in Post-its, or a few columns of index cards on your desk. The important thing to remember is that any task you write down won’t stay in the same spot for long. After filling out the three columns—"To-Do," "Doing," and "Done"—jump into the items in your “Doing” section. Any items you complete should be relocated to the "Done" column, and any items you start from the "To-Do" section should move to under "Doing." Ideally the board should be situated in a spot that’s easy to glance at throughout the day. That way you can easily visualize your progress. Sam Bennett likes to be realistic when planning out her day. Instead of writing a to-do list, the author of Get It Done: From Procrastination to Creative Genius in 15 Minutes A Day takes the pressure off by creating a "could-do" list. In order to weigh the importance of her optional tasks, she plugs them into a worksheet. She suggests reserving columns for tasks, time (how long each task will take), expense (if any), inclination (how appealing the task is on a scale of one to 10), and the return on your investment (also scaled one to 10). Based on those metrics, it should be easy to see which items take priority—and if you don’t have time to get to everything, it’s not the end of the world.